Only a few feet separate the northern features of Sawmill Group from the southern features of Grand Group. But close observation of dependencies and interactions between springs allow a clear assignment in most cases. As a result Crystal Spring and Belgian Pool are regarded as members of Grand Group. 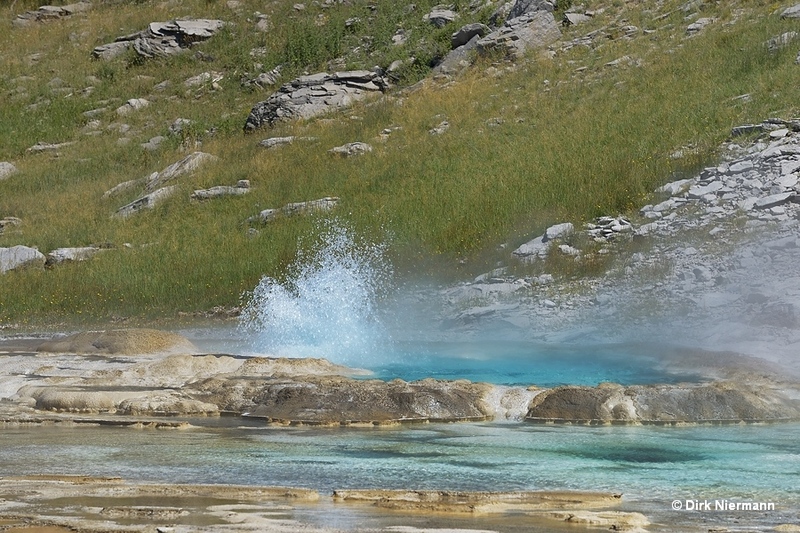 Crystal Spring almost exclusively acts as an intermittent spring, only very few geyser eruptions are known. The adjacent Belgian Pool is a quiet spring. The name refers to the accidental death of a 42-year-old Belgian newspaper editor, who fell into the pool in July 1929 while hurriedly heading towards the erupting Castle Geyser. Before, Belgian Pool was called Oyster Spring. Across the boardwalk lies the frequently spouting Bulger Spring. 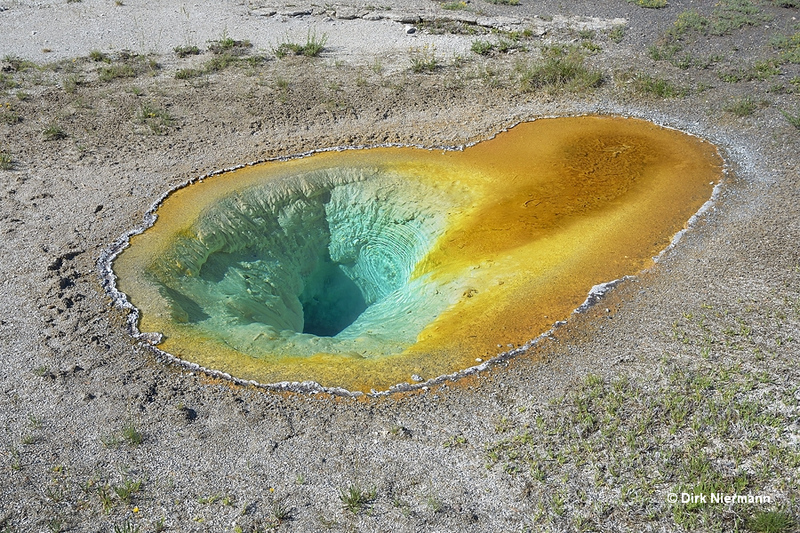 A gaping hole directly in front of Bulger is a rarely playing geyser of its own, informally and ingeniously named "Bulger's Hole". 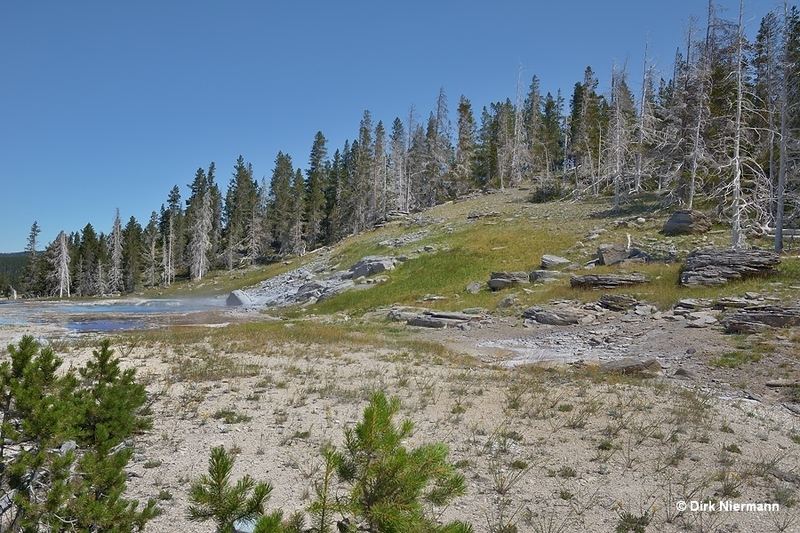 Subsequently, the boardwalk proceeds to the Grand Geyser Complex. 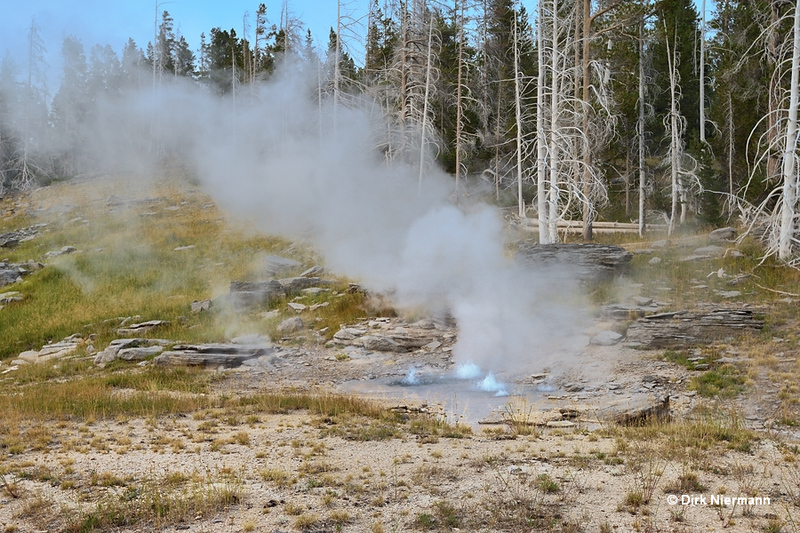 Grand Geyser itself is located at a somewhat larger distance to the trail. Therefore, and because it's even with the ground, first-time visitors often need a second look to detect its pool although it's not small. 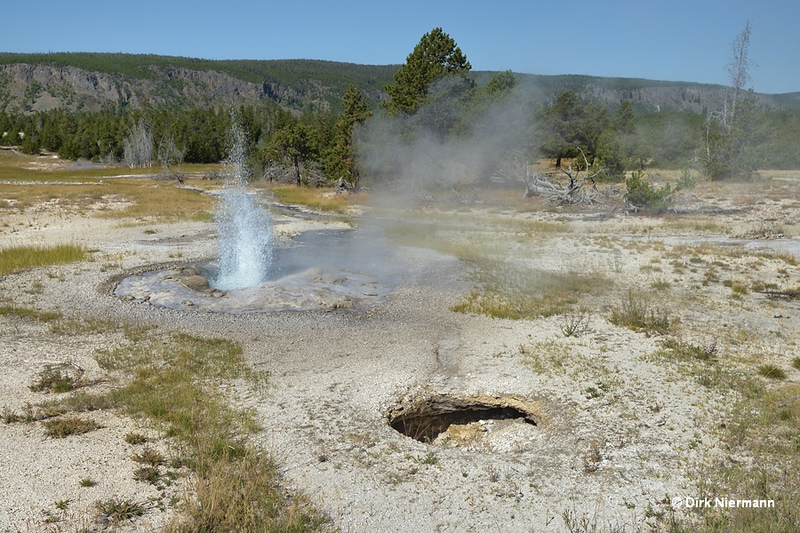 Grand Geyser is surrounded by at least six smaller geysers. All are interconnected somehow and affecting each other more or less. 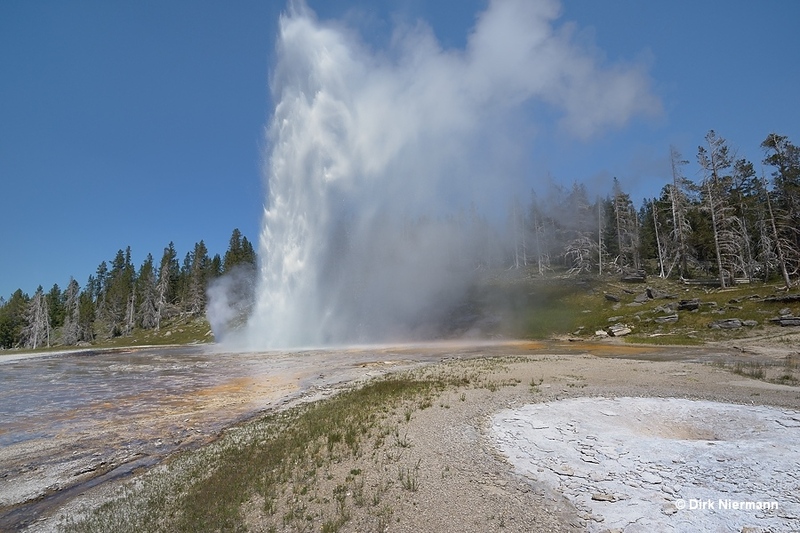 Grand is one of the geysers, whose eruption times are predicted by the National Park Service. Its interval varies usually between 5.5 and 9.5 hours. However, also significantly longer intervals are known. An eruption of Grand is divided up into a series of up to six bursts (more are very rare), each lasting several minutes. Usually the height of the first burst is below average, but the next ones may reach up to 55 m (180 feet). Experiencing an eruption of Grand and its satellite geysers really is one of the most impressing and magnificent natural spectacles anywhere. 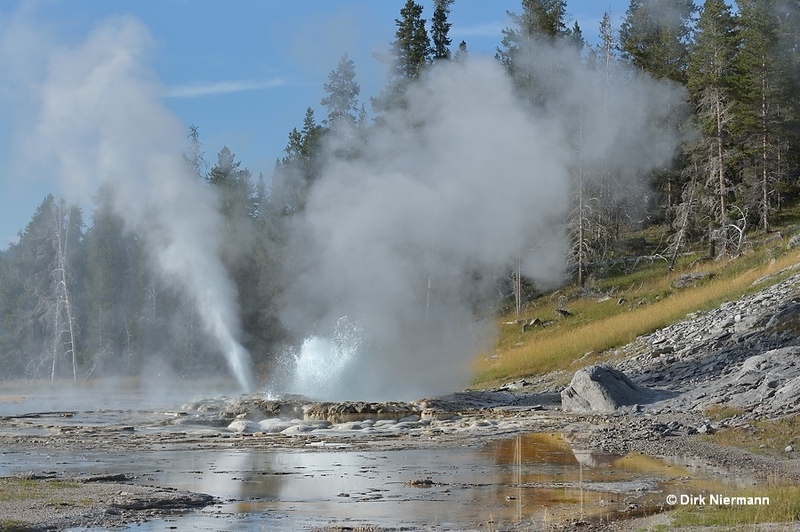 Most observers use the behavior of Turban Geyser as an indicator for the coming of Grand's first burst. They know that Grand never erupts if Turban has not started its play. However, not every start of Turban does mean that Grand will set in. 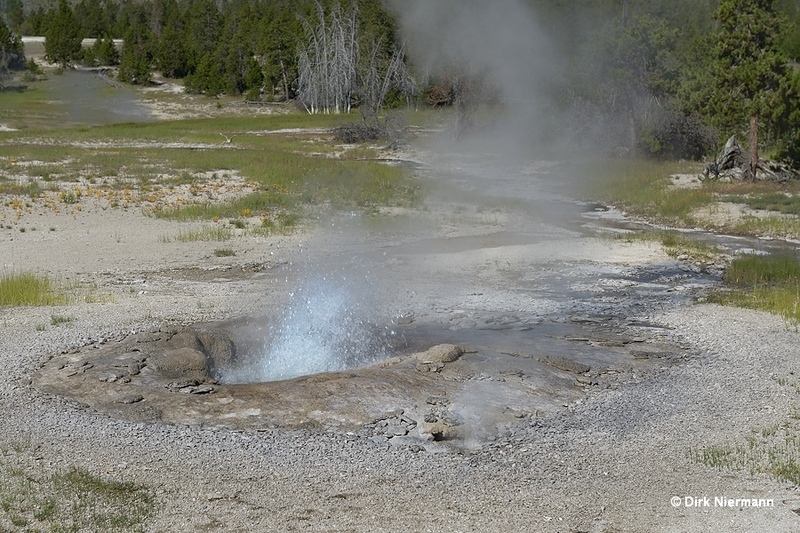 There is strong evidence that Turban Geyser was the hot spring close to Grand, which claimed the life of a 51-year-old woman from the State of Washington in August 1905. 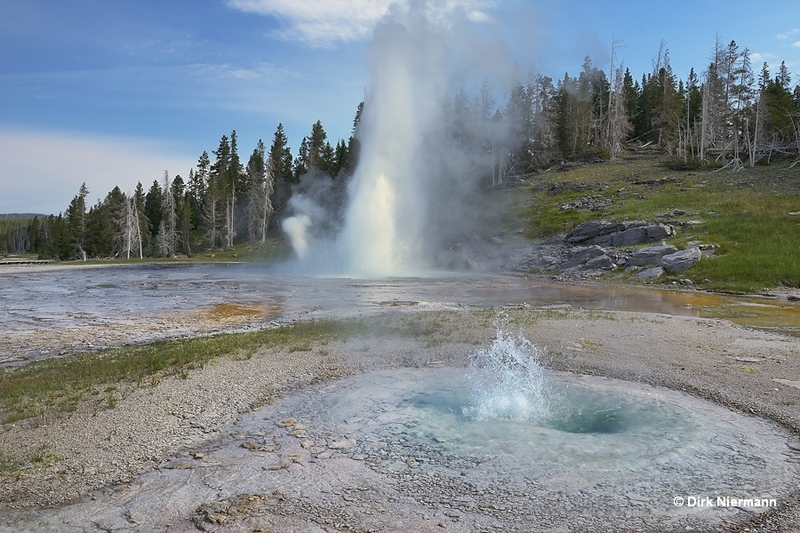 At a time before boardwalks were installed in the thermal areas, she stumbled or slipped backwards into the geyser, and, though pulled out quickly, died two weeks later in a hospital. Some minutes after Grand's first burst Vent Geyser joins the concerted play of Grand and Turban. Even after Grand has finished, Vent and Turban continue for one hour or more. Note the little spurting vent on top of Turban's crater rim on the next photo. The activity of other geysers of the complex seems not to be linked so strongly to Grand's play. 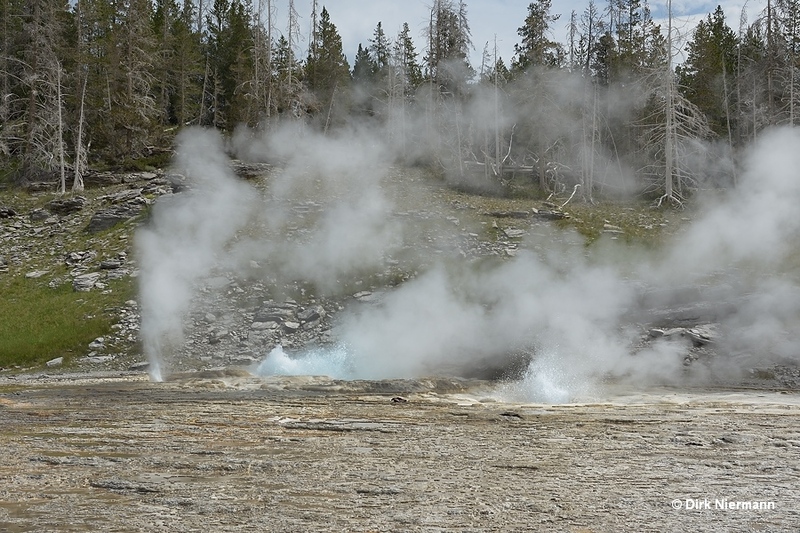 West Triplet Geyser close to the boardwalk erupts irregularly, sometimes during Grand's quiet interval, sometimes during Grand's play. 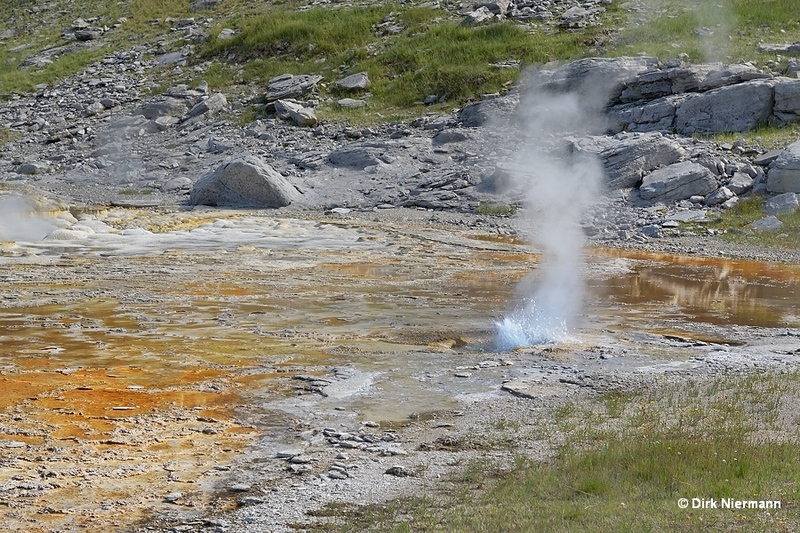 It seems that West Triplet is the last "survivor" of the three Triplet Geysers. 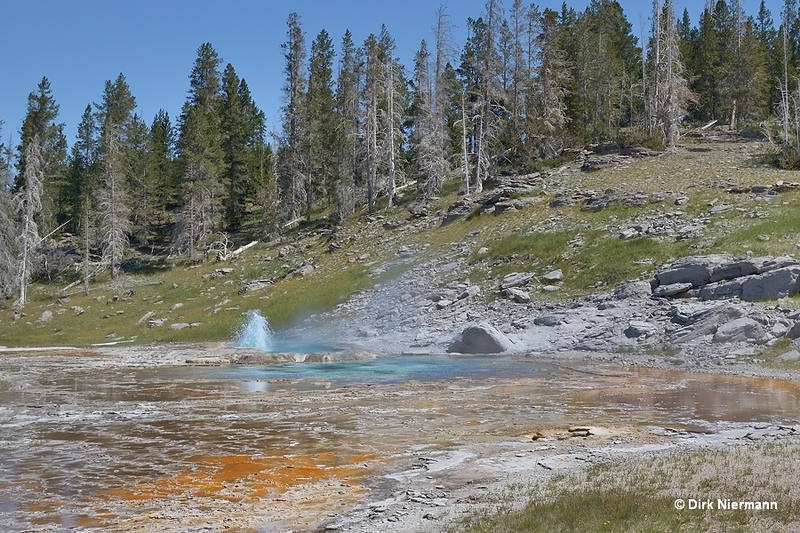 North Triplet and East Triplet Geysers have been inactive for decades. 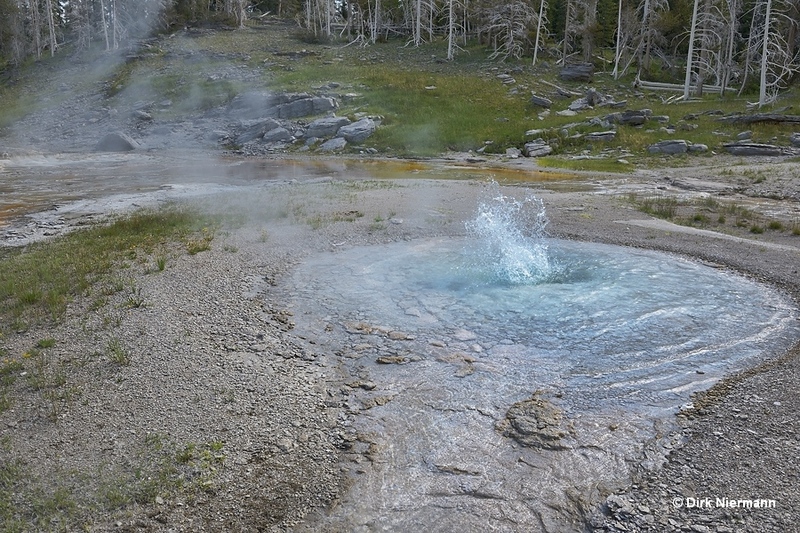 Because West Triplet Geyser is located next to the boardwalk, there may be some risk of getting into contact with its hot water. 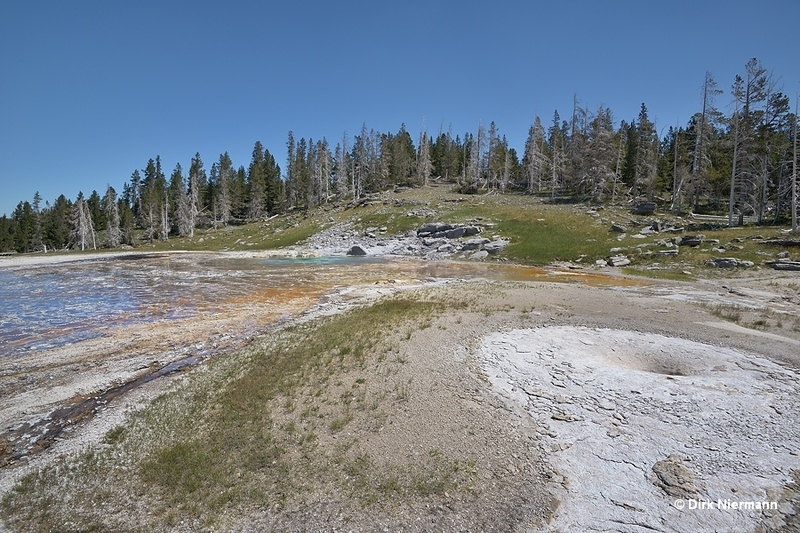 Indeed, in June 2006 a 6-year-old boy from Utah slipped on the boardwalk and fell into the geyser's shallow pool shortly after an eruption. He was severely scalded on arms and legs but survived fortunately. Between West Triplet and Grand the little Percolator Geyser shows up. It often erupts in concert with West Triplet or short before Grand starts to play. 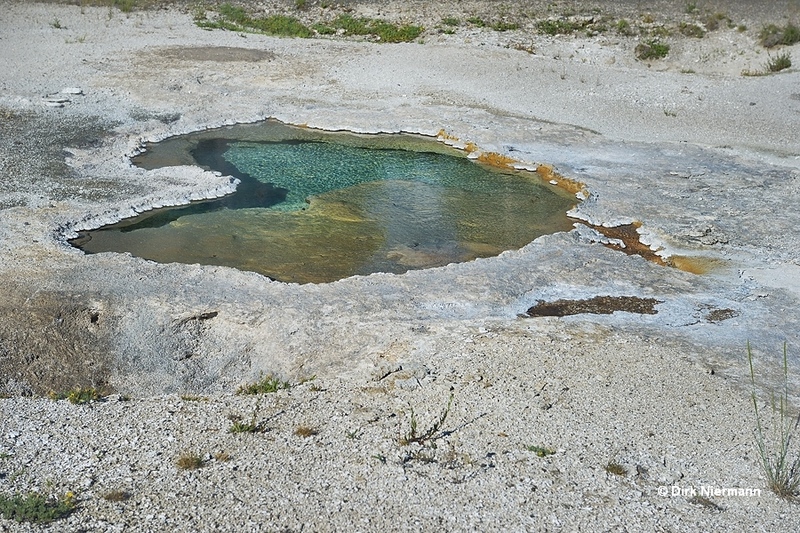 Rift Geyser is the southernmost member of the Grand Complex. It plays from many cracks at the base of the hill. Rift's somewhat irregular activity is linked to West Triplet Geyser and it has also been observed that it delays the start of Grand.